Inventory We are a resale marketplace, not a box office or venue. Ticket prices may exceed face value. This site is not owned by AT&T Center . 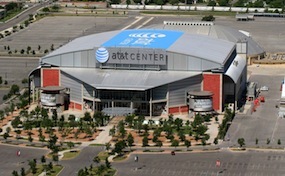 The AT&T Center is an indoor arena located in San Antonio, Texas, USA. It was completed in 2002 as the SBC Center at a cost of $175 million, financed by county issued bonds which were supported by a hotel-occupancy and car rental tax increase and an additional contribution of $28.5 million from the Spurs. The arena is home to the San Antonio Spurs of the NBA and the San Antonio Rampage of the AHL in the winter spring, the San Antonio Silver Stars of the WNBA in the summer, and the annual San Antonio Stock Show and Rodeo held in February. The PRCA, who holds the San Antonio Stock Show and Rodeo, also hosts an Xtreme Bulls tour event annually at around the same time as the Stock Show. CenterSanAntonio.com is a privately held company that specializes in the sale of tickets in the secondary market. We are not affiliated with any official supplier or box office. To purchase tickets to any ATT Center in San Antonio events simply call our operators at anytime or click on the event you wish to attend.